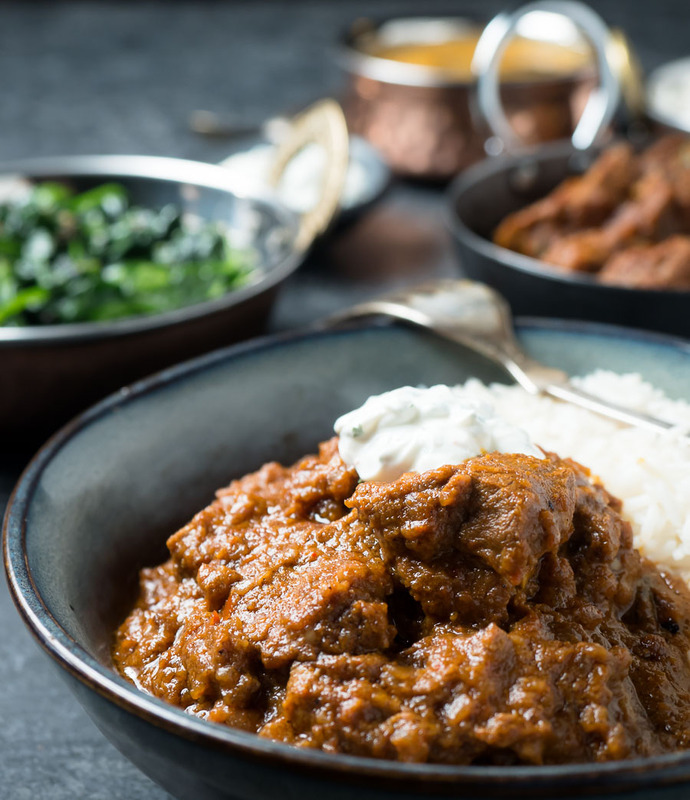 Laal maas is a creamy, rich and spicy lamb curry from Rajasthan. If you’ve never heard of it, it’s time to fix that. This is a homestyle curry. Not restaurant style. Slow cooking. Gentle simmering. Tender, flavourful lamb. And a crazy delicious sauce. 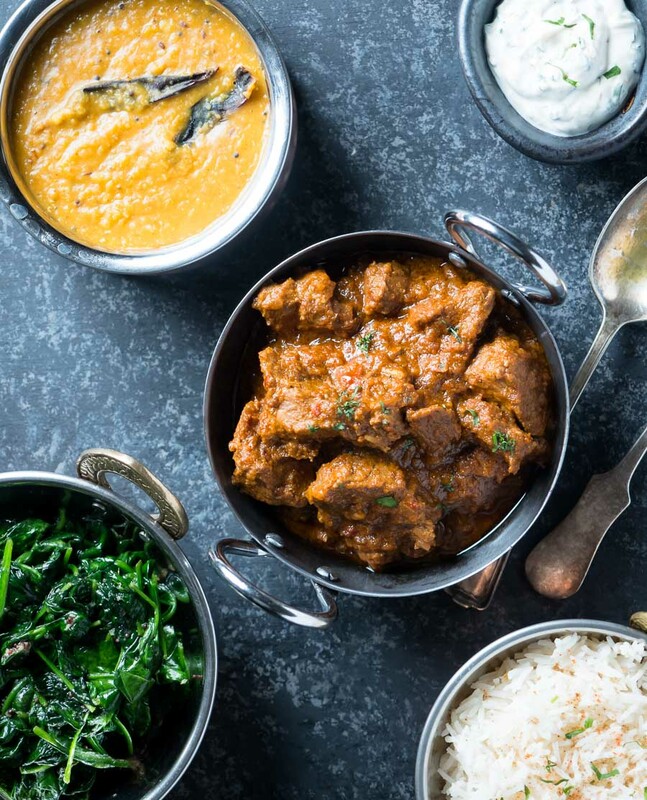 I do a lot of restaurant style Indian recipes on this blog. But don’t think I don’t love home cooking. It’s not what you get from your local joint. This is what people cook at home. For family. For friends. 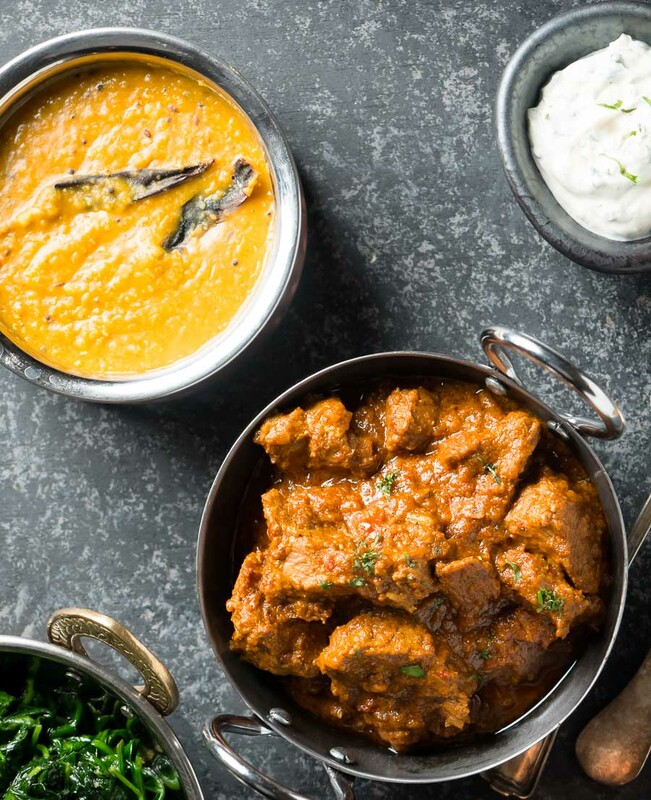 If you’ve been making restaurant style curries. And you like a spicy lamb curry. Then laal maas is something you need to try. Don’t be put off by the amount of chili in this recipe. It sounds like a lot. But it’s not that hot. I’d say medium hot. Tingle your tongue hot. Not burn a hole in the back of your head hot. 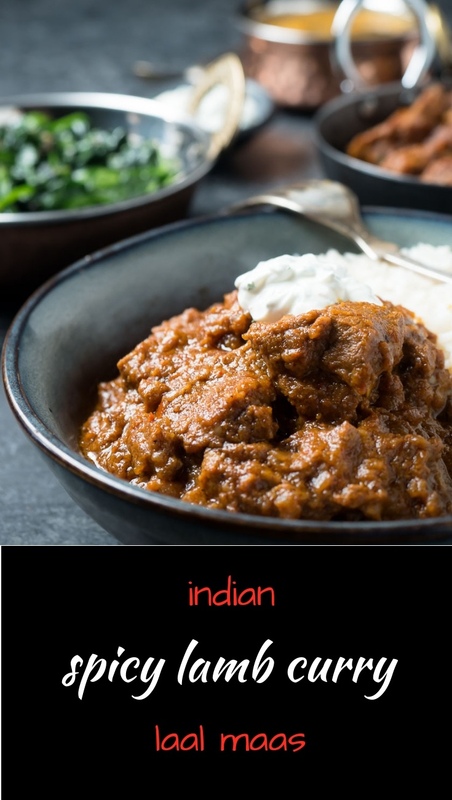 Technically laal maas is supposed to be a fiery lamb curry. I like hot. But not everybody does. So I tone it down a bit. If you want hotter then add more chili to the curry paste. Or mix in a bit of hot Indian chili powder in with the paste. Easy as that. Kashmiri chilies are why it’s not screaming hot. Be sure you get the right ones. They give the curry a nice colour. And they aren’t that hot. Lots of flavour though. That’s why I’m a fan. You can get them at any Indian grocer. Just ask them. They will fix you up. This one does anyway. That’s one thing I have picked up from restaurant style cooking. There’s a pretty good South Indian restaurant in town. They have shared some tips and tricks. For some of their curries they start with a paste. Their vindaloo is based on a paste. They won’t give me the recipe but I can guess. In fact, I’m working on a vindaloo paste right now. Stay tuned. The idea of a chili paste is pretty common in Mexican cooking. I do it when I’m making chili. Puree the chilies along with some aromatics. Then fry it up to smooth out all the flavours. Works great. So I make my laal maas with a paste. Not conventional. But a great way to do it. Streamlines the recipe some. And the flavours work well. Leg of lamb makes a great roast. Indian style or not. But I don’t think it makes the best laal maas. Or any lamb curry for that matter. Certainly your butcher isn’t cutting up leg of lamb and calling it lamb stew. No way. They would lose money. But that’s not why I prefer lamb shoulder for curries. For any stew really. I like tougher cuts when I braise. Beef short ribs. Chuck. Pork shoulder. See what I mean. You knew it too. Lamb is no different. Shoulder is cheaper too. It’s just a win win. Laal maas can be made with goat meat as well. That’s actually what they usually use. They call it mutton but they mean goat. If I could get fresh goat without driving clear across town I would make it with goat as well. But lamb curry rocks so I’m not too worried. What’s with the pictures of really red laal maas? I look at food pictures all the time. And I don’t understand what’s going on with some of the laal maas recipes out there. There are 15 whole red chilies in the curry paste. There’s a full tablespoon of kashmiri chili powder. And a tablespoon of paprika. And it’s not bright red. This laal maas is kind of reddish brown. Nowhere near the red I see out there. Either they are putting in a cup of kashmiri chili or they are using food colour. My guess is food colour. Or photoshop. Don’t see how they get there otherwise. Raita is usually cooling. Something to put out the fire. Sometimes with cucumber and lemon. Sometimes just cilantro and salt. But usually a place to hide from the fire. Not here though. Just the opposite. A couple crushed kashmiri chilis in the raita gives it some bite. It’s a little twist. If you think the curry has enough bite leave the chili out. Maybe add a little lemon juice instead. Make it your own. Laal maas. 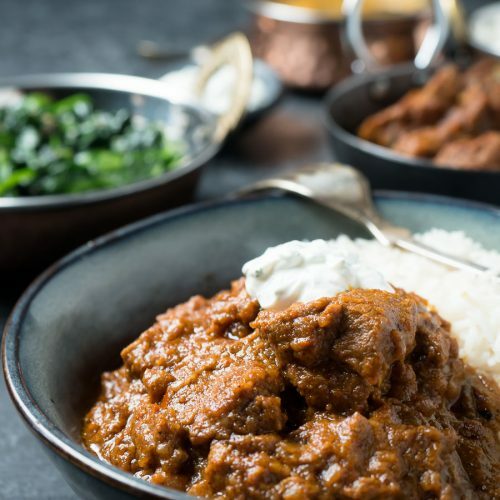 Spicy lamb curry. Homestyle. Try it sometime. 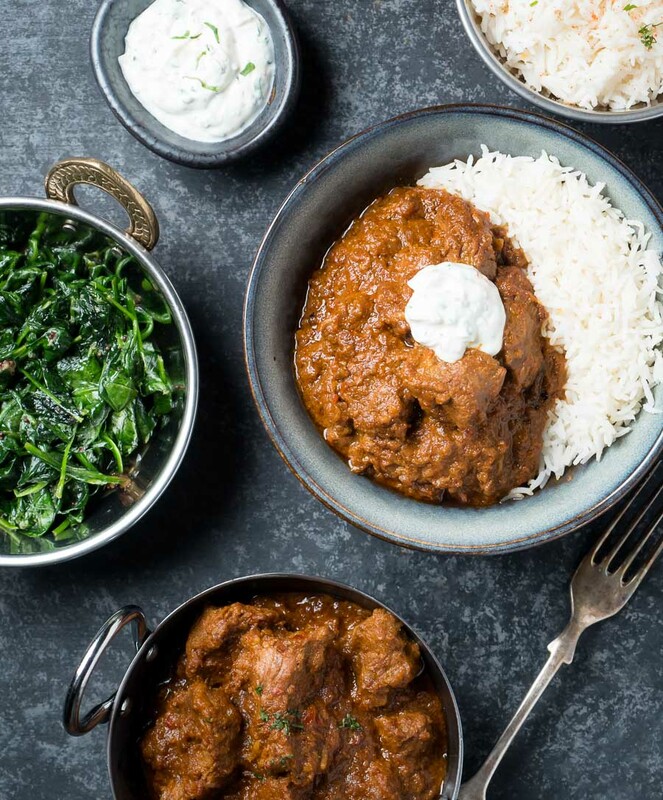 It’s just tasty, tasty Indian comfort food. 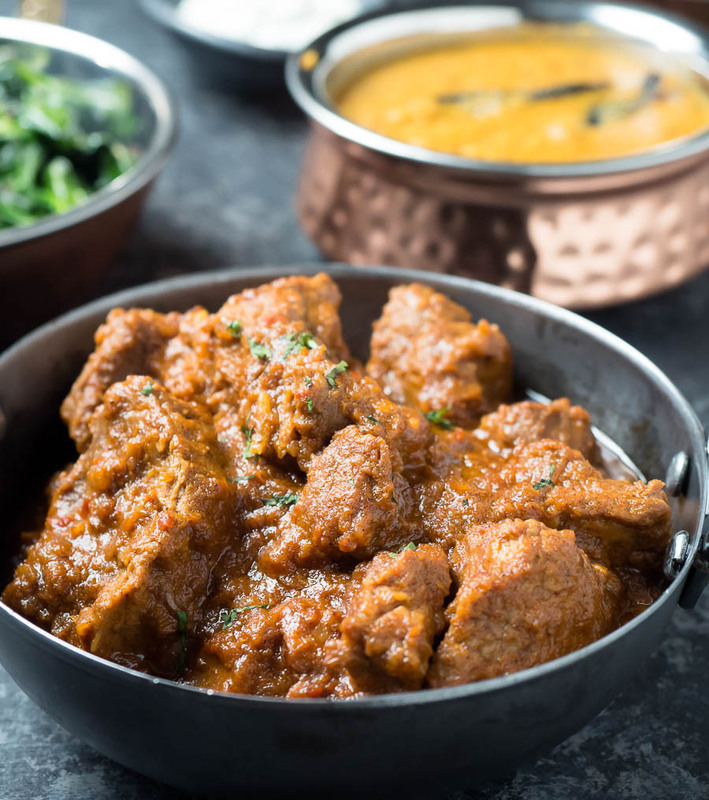 Laal maas is a spicy lamb curry from Rajasthan India that's sure to be a crowd favourite. Seed and stem the dried ashmiri chilies. Just break them in half and give them a shake. A few seeds won't kill you. Place the chilies in hot tap water and soak until rehydrated. This takes about 30 minutes. Combine the rehydrated chilies along with the rest of the paste ingredients in a blender or food processor. Add a bit of water. Puree. Keep adding water until a paste forms. Really have at it. The skins from the chilies are pretty hard to break down. Combine the lamb, garam masala, yoghurt and salt. Mix. Cover and refrigerate for one hour. Pre-heat your oven to 325F. Pre-heat a dutch oven large enough to hold all the ingredients over medium heat. Add 4 tbsp of oil. Add the black and green cardamom and cook for 20-30 seconds. Add the onions and cook until they are well browned. Regulate the heat to prevent burning. Stir them often. Push the onions to the side around the edges of the pot. Add the remaining two tbsp oil to the middle of the pot. Pour in the laal maas curry paste and fry until it darkens. This takes a couple minutes. Stir constantly and regulate the heat to avoid the paste burning. Watch your onions. Once the curry paste has darkened slightly mix it in with the onions. Add the tomato paste. Cook the onion/paste mixture over medium low heat for 4-5 minutes. Add the lamb and marinade. Stir to mix everything together. Cook about 5 minutes over medium low heat. Don't forget to give it stir every minute or so. Add one cup of water. Stir to combine. Cover and place the dutch oven in the 325F oven. Cook until the lamb is tender. This takes somewhere around 90 minutes to 2 hours. It depends on the size of the chunks. It's ready when it's ready. Taste and adjust salt. Serve with spiced raita. Combine the yoghurt, salt, crushed chili and cilantro. Mix to combine. Let sit at room temperature while you cook your curry. In indian, main course, meat. Bookmark the permalink. Thanks! I hope you like it as much as I do. This was really easy to make, the times on the recipe are realistic. I liked the spiciness, but it is not too hot. I did take a small liberty with the instructions, anywhere that the recipe called for water to thin things out I substituted the water that had been used to soak the chillies, it looks like a red tea and has a little kick to it. I highly recommended Laal Maas. Awesome to hear! I don’t use the chili water because I find sometimes (depends on the chilies I expect) it can be bitter. But if it’s not bitter that’s a great tip.